National Grilling Month is here! 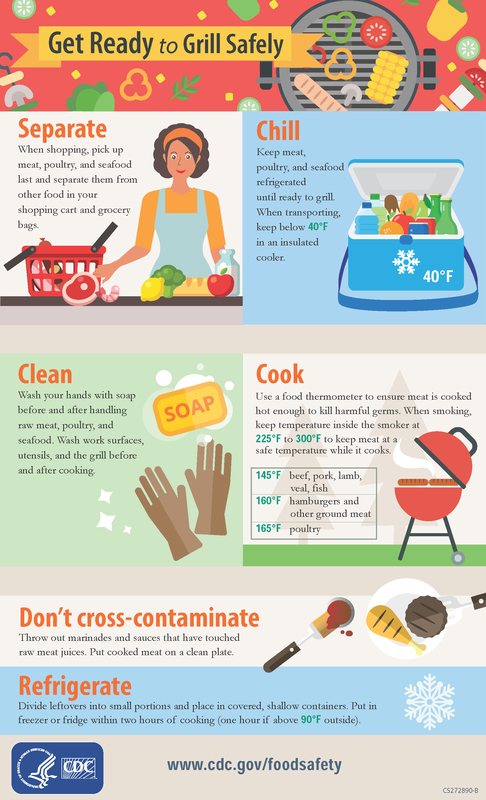 Prevent harmful bacteria from making an appearance at your next cookout by following important food safe guidelines for a safe grilling season. A grill is one of the best ways to cook summer dinners and have outdoor parties. However, food poisoning peaks in the summer months when warmer temperatures cause foodborne bacteria to flourish. Furthermore, a grill can also be a means to transmit bacteria if care is not taken with how food is properly separated and handled. Learn about foodborne pathogens, cross contamination, cold and hot food safety, and best practices to prevent foodborne illness. Food Handler Training: Only $7.00! So whatever the grilling occasion, it’s important to follow food safety guidelines to prevent harmful bacteria from multiplying and causing foodborne illness. Wash your hands with soap before and after handling raw meat, poultry, and seafood. Wash work surfaces, utensils, and the grill before and after cooking. Use a moist cloth or paper towel to clean the grill surface before cooking. If you use a wire bristle brush, thoroughly inspect the grill’s surface before cooking. Wire bristles from grill cleaning brushes may dislodge and stick into food on the grill. Keep meat, poultry, and seafood refrigerated until ready to grill. When transporting, keep below 40°F in an insulated cooler. When shopping, pick up meat, poultry, and seafood last, right before checkout. Separate them from other food in your shopping cart and grocery bags. To guard against cross-contamination, put packages of raw meat and poultry into individual plastic bags. Throw out marinades and sauces that have touched raw meat juices, which can spread germs to cooked foods. To prevent foodborne illness, do not use the same platter, cutting board or utensils for raw and cooked foods. Harmful bacteria present in raw meat and poultry and their juices can contaminate cooked food. Use clean utensils and a clean plate to remove cooked meat from the grill. Use a food thermometer to ensure meat is cooked hot enough to kill harmful germs. When smoking, keep temperatures inside the smoker at 225°F to 300°F to keep meat a safe temperature while it cooks. Divide leftovers into small portions and place in covered, shallow containers. Put in freezer or fridge within two hours of cooking (one hour if above 90°F outside). This grilling season, NFPA tests your knowledge and demonstrates the proper way to use your grill safely to prevent fires. Does Grilling Pose a Cancer Risk? Some studies suggest there may be a cancer risk related to eating food cooked by high-heat cooking techniques as grilling, frying, and broiling. Based on present research findings, eating moderate amounts of grilled meats like fish, meat, and poultry cooked — without charring — to a safe temperature does not pose a problem. To prevent charring, remove visible fat that can cause a flare-up. Cook food in the center of the grill and move coals to the side to prevent fat and juices from dripping on them. Cut charred portions off the meat. 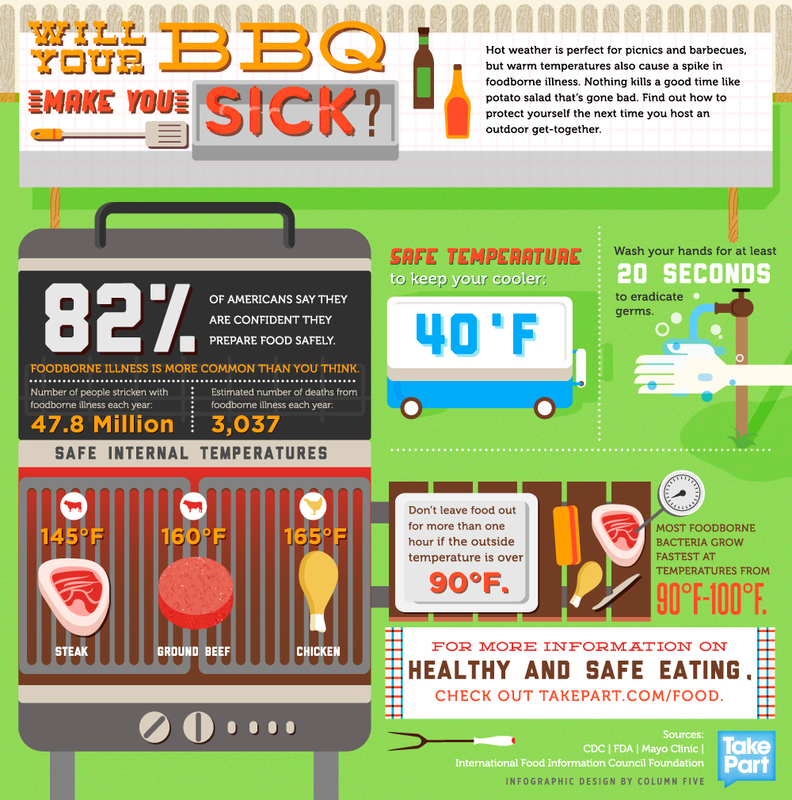 CDC – BBQ IQ — Get Smart. Grill Safely. Welcome to Food Safety Training Courses - Leading national provider of ANSI food handler training and food manager certification.